Please join us for our first “SNN Shares” event this January, where we will explore Hong Kong’s public services. SWD, DA, HA, LWD, EDB… what do these mean? 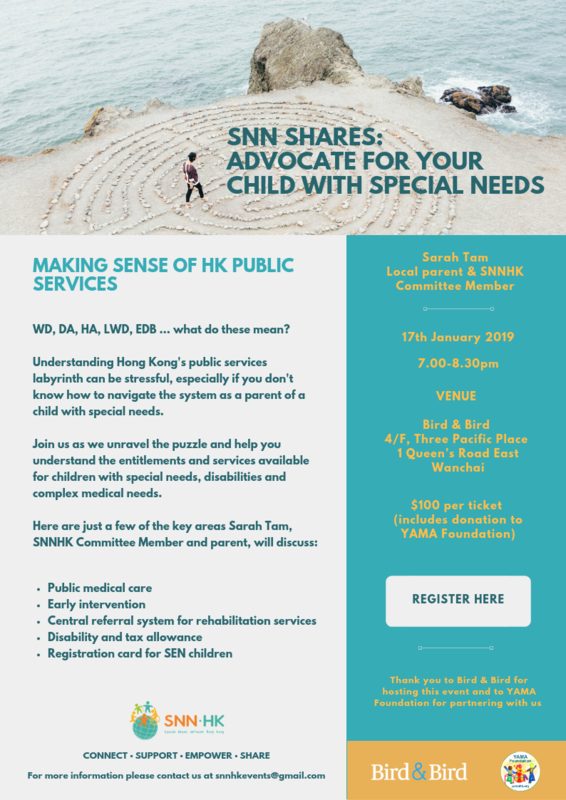 Join us as we unravel the puzzle and help you understand the entitlements and services available in Hong Kong for children with special needs, disabilities and complex medical needs. * Please arrive in time to register at the lobby entrance of Three Pacific Place from 6:30pm. The talk will start promptly at 7pm. With thanks to Bird & Bird and YAMA Foundation for partnering with SNNHK for this event.